One way employers can mitigate increasing deductibles is by packaging a high-deductible health plan with either a health savings account (HSA) contribution or a health reimbursement arrangement (HRA). Either can be used to bridge some or all of the gap between a lower deductible and a higher deductible while reducing insurance premiums, and both offer tax benefits for employers and employees. However, there are advantages and disadvantages to each approach that employers need to consider. The employee owns the account and can take it when changing jobs. HSA contributions can be made by the employer or employee, subject to a maximum contribution established by the government. Triple tax advantage – funds go in tax-free, accounts grow tax-free, and withdrawals are tax-free as long as they are for qualified expenses (see IRS publication 502). Funds may accumulate for years and be used during retirement. The HSA must be paired with an IRS qualified high-deductible health plan (QHDHP); not just any plan with a deductible of $1,300 or more will qualify. Costs are more predictable as they are not related to actual expenses, which can vary from year to year; contributions may also be spread out through the year to improve cash flow. Employees become better consumers since there is an incentive to not spend the money and let it accumulate. This can result in an immediate reduction in claims costs for a self-funded plan. HSAs can be set up with fewer administration costs; usually no administrator is needed, and no ERISA summary plan description (SPD) is needed. The employer is not held responsible by the IRS for ensuring that the employee is eligible and that the contribution maximums are not exceeded. Employees cannot participate if they’re also covered under a non-qualified health plan, which includes Tricare, Medicare, or even a spouse’s flexible spending account (FSA). Employees accustomed to copays for office visits or prescriptions may be unhappy with the benefits of the QHDHP. IRS rules can be confusing; IRS penalties may apply if the employee is ineligible for a contribution or other mistakes are made, which might intimidate employees. Employees may forgo treatment to avoid spending their HSA balance or if they have no HSA funds available. Only an employer can contribute to an HRA; employees cannot. The employer controls the cash until a claim is filed by the employee for reimbursement. HRA contributions are tax deductible to the employer and tax-free to the employee. To comply with the Patient Protection and Affordable Care Act (ACA), an HRA must be combined with a group medical insurance plan that meets ACA requirements. HRAs offer more employer control and flexibility on the design of the HRA and the health plan does not need to be HSA qualified. The employer can set it up as “use it or lose it” each year, thus reducing funding costs. An HRA is compatible with an FSA (not just limited-purpose FSA). Depending on the employer group, HRAs can sometimes be less confusing for employees, particularly if the plan design is simple. HRA funds revert to the employer when an employee leaves – which might increase employee retention. Self-employed individuals cannot participate in HRA funding. There is little or no incentive for employees to control utilization since funds may not accumulate from year to year. More administration may be necessary – HRAs are subject to ERISA and COBRA laws. HRAs could raise HIPAA privacy concerns and create the need for policies and testing. Both HSAs and HRAs can be of tremendous value to employers and employees. As shown, there are, however, a number of considerations to determine the best program and design for each situation. 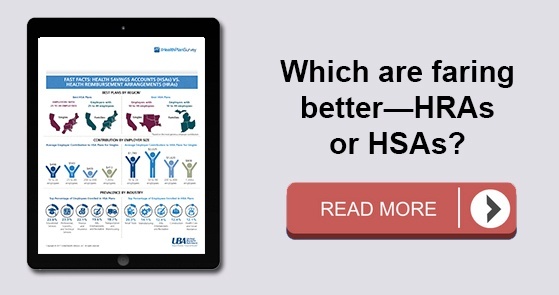 In some cases, employers may consider offering both, allowing employees to choose between an HSA contribution and a comparable HRA contribution, according to their individual circumstances.